This review is of the cut shown at the BFI London Film Festival in October 2016 – the UK release date is currently listed for March 31st 2017. Ben Wheatley’s most conventional film yet is also probably his most enjoyable, simply because he and co-writer Amy Jump have moulded Free Fire to be the ultimate tribute to long, violent shoot-outs in movies, arguably one of the aspects of a gun-heavy movie that we as a psychologically questionable audience always look forward to in a film like this. Legendary bloody shoot-outs in films like The Wild Bunch and Taxi Driver are given a loving homage here, in a film that is almost entirely one long shoot-out from beginning to end – and it is as awesome as it sounds. Set in Boston in the late 70s, a group of finely-dressed individuals – including a couple of Irish IRA dealmakers (Cillian Murphy and Michael Smiley), an enigmatic female facilitator (Brie Larson), two stoner henchmen (Sam Riley and Enzo Cilenti), and a suave middleman (Armie Hammer) – meet at an abandoned warehouse one quiet night. They are there to purchase several crates of guns from shady South African arms dealer Vern (Sharlto Copley), and despite a few scenes of escalating tension, things seem to go smoothly – until one of Vern’s associates (Jack Reynor) recognises one of the stoners as doing something repulsive to his cousin the night before. From there on, it’s pure chaos in the most delightful trigger-happy way imaginable. It’s no coincidence that none other than Martin Scorsese is listed as an executive producer on this, because Free Fire feels like exactly the kind of film the legendary auteur would have made right after his 1973 film Mean Streets, if he hadn’t decided to give Robert De Niro a Mohawk instead. Wheatley manages to both replicate the feel and tone of an early Scorsese movie whilst retaining his own high-octane style, although fans of his earlier and more trippy works like High-Rise or A Field in England might be disappointed by the lack of visual oddness here. Instead, the weird factor is purely in the writing, more specifically how a simple situation quickly escalates into something far more dangerous and deadly, and how everyone’s lives are put at risk because of a couple of bruised egos and a case of being in the wrong place at the wrong time. The dialogue is drenched in irony, wit and casual moments of idiocy, like a screwball comedy that’s packing heat, and it helps make the characters not necessarily sympathetic, but more fun to watch either get their comeuppance or ensure someone else gets their comeuppance. The beauty is that you’re not really asked to choose a side here; you’re just there for the spectacle of a group of people firing at each other for 90 straight minutes, and how it can get more insane from there. The cast, probably Wheatley’s most diverse ensemble yet from a number of known Hollywood actors like Larson, Copley and Hammer, to some smaller names more familiar to British audiences like Smiley, Riley and Noah Taylor (who plays another of Vern’s associates), clearly seem to be having a ball here. Copley’s slimy arms dealer with a tacky suit to match is the comedic highlight, earning some of the biggest laughs from his sheer narcissism alone, while I am hard-pressed to think of another time that Hammer has ever been so charismatic in the kind of character role he excels at. They are definitely the standouts, but everyone else manages to deliver the right amount of tension and black-hearted lunacy as well in this increasingly deranged film. Wheatley’s use of the minimalist location – shot in a warehouse just outside of Brighton, doubling for one in 1970s Boston – also helps to keep everything in check, never cheating by cutting away to somewhere completely different, and surprisingly incorporating a couple of unexpected items into a setting where they wouldn’t otherwise function (a van makes a very memorable, and gory, impression). How Wheatley managed to keep it all in balance, and in the one location throughout the entire movie, is quite extraordinary, and though Free Fire is probably the director’s most grounded film yet in his filmography (to a point, anyway), it’s definitely his most enjoyable to date. 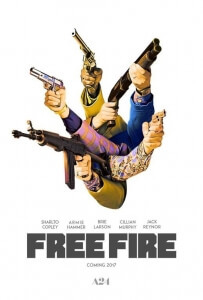 Free Fire is a hugely enjoyable high-octane homage to violent shoot-outs in movies, with director Ben Wheatley keeping the momentum going throughout with scattershot comedy and highly entertaining moments of sheer lunacy and insanity, making for one hell of a fun spectacle to witness.